Warning: this post contains scary insects……..
Our rather sudden decision to emigrate to New Zealand in 1967 was really just an impulsive lark. It just seemed a good idea at the time. We were newlyweds and with my mediocre degree my prospects in the UK did not seem in any way promising. At the time commonwealth countries were making some tempting offers to teachers and nurses, so we fitted the bill. Once the idea took hold, it was a Goldilocks’ porridge choice between Australia (too hot), Canada (too cold) and New Zealand (just right?). A choice based on stereotypes and skimpy research, and in my case influenced by the example of a boy at Fryent primary school who, years before, had beamed down in London NW9 one day from planet New Zealand. Actually I don’t think he remembered much about NZ, but I became so fascinated with this kid from a country on the other side of the world that I read up about it in my second home, Wembley town hall library. (No internet then). The land of the long white cloud must have lodged itself in my young brain as a romantic aspiration; after all for us Brits it’s as far as you can go south without starting to come back. 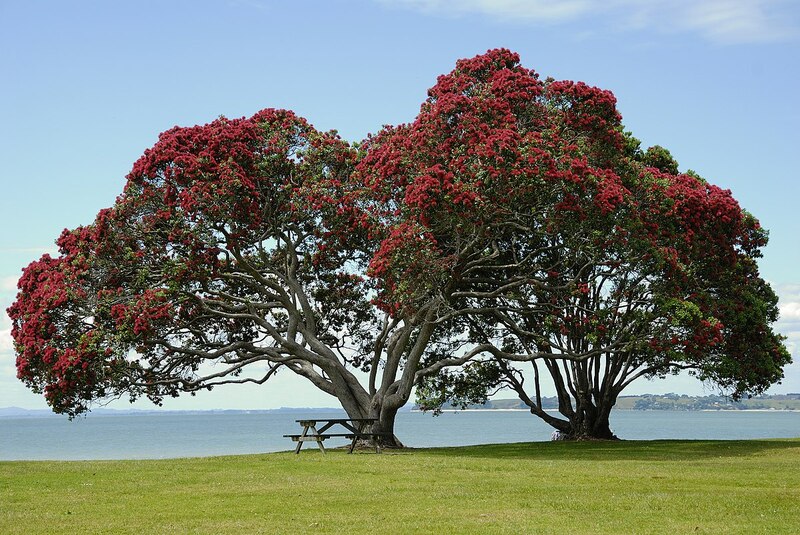 In the end the choice was arbitrary, finalised in the National Library of Scotland, triggered by an illustration of Auckland harbour in an encyclopedia, featuring exotic scarlet blossomed trees fringing a sunlit beach. A few months later we walked under these very trees – pohutakawa (kiwi Christmas trees,) some of the most beautiful trees anywhere. By the way it’s worth going to the North Island at Christmas, just to see the pohutakawas. A year or so later we moved into a rented house which had one in the garden, and its crimson needles used to fall on the kitchen window sill. One morning I saw one of the needles get up and walk away. It was a perfectly camouflaged stick insect, obviously disturbed by the horrific sight of me eating corn flakes. To be fair, I was equally disturbed. The assisted passage deals on offer were much of a muchness; in exchange for my labour for an agreed term, the host country would guarantee me a job and pay most of our outward fares, but not any return costs. Fair dinkum, on the face of it. In the case of New Zealand the agreed term was two years and the personal cost was £50; if I were to quit the job or tried to leave the country within the two years I would have to reimburse the government’s costs, including the outward fares. After an interview at New Zealand House in London with a rather nice representative of the NZ Department of Education, and not a little form filling, we were accepted in principle as potential immigrants. Then snag number one cropped up. It wasn’t long before we discovered that New Zealand bureaucracy was, if anything, even more rigid than the British version.The deal was conditional on passing various health checks, and I had been stupid enough to disclose that at the age of eight I had suffered a major eyesight collapse, which had been successfully treated. Apparently this was a deal breaker. After challenging the relevance of the childhood experience, and with some help from the education guy, the immigration gnomes decided that the deal would be conditional on a positive outcome of a rigorous private eyesight examination. I suppose an NHS test was not good enough for them, even though my eyesight had been restored by an inspired NHS optician. Fortunately I passed the test, so we were off and running. After packing our permitted trunks we duly caught the boat train from Waterloo to Southampton docks with our hand luggage and what money we had managed to save, to board the Shaw Savill cruise liner Northern Star, bound for Wellington. As the train rumbled towards the dock gates we passed by the Cunard South Western Hotel, little imagining that this was to be my workplace almost a decade later. My mum and dad saw us off in the old-fashioned way, waving from the dockside. We didn’t see them again for six years. The journey out was, in effect our second honeymoon, a six-week single-class luxury cruise via South Africa and Australia, at the time when the Suez Canal was closed due to a little local difficulty. It was an adventure of course, but let’s just say we are not tempted these days by the current fashion for cruises so beloved of retired people wishing to see the world. It started badly, or rather didn’t start, due to a pesky mechanical failure. When we woke up the next morning expecting to see the open sea, the ship was anchored off the Isle of Wight, with engineers in small boats trying to release one of the stabilizers. I guess they had the wrong spanners because after a while they gave it up as a bad job, and we sailed all the way to New Zealand with one jammed stabilizer, which was worse than none at all. This was fine until we hit the Indian Ocean, when I felt queasy all the way to Australia, but never actually threw up. On the way we stopped at Las Palmas, Capetown, Durban, Perth, Melbourne and Sydney. We made friends with an anglo-south african couple who had taught us to play Canasta by the time we made the Canary Islands. In Capetown and Durban we were appalled by the reality of Apartheid, which didn’t go down too well with our Canasta partners, who got off there. In Perth we met up with my Uncle Bert and Auntie Nell, who I had never met before, and in Melbourne we stayed with some of Margaret’s lovely relatives. By the time we got to Sydney, we had had enough of stilted conversation at the Chief Engineer’s dining table, deck games and mindless competitions. Roll on Wellington. Then came snag number two, NZ customs. Before we left we had absolute assurances regarding my job, guaranteed accommodation, and a customs exemption regarding wedding presents. As a result our trunks contained little else but brand new clothes and household goods, including a ridiculous amount of towels. Unfortunately the customs officer who came aboard would have none of the newlywed immigrant exemption, so we were presented with an import bill for hundreds of dollars which by then we didn’t have. I would not have paid it even if we had the money as the wedding present exemption was government policy. This was breach of contract and daylight robbery to boot. Our trunks were duly impounded on the docks. Not quite the welcome we might have expected. It got worse. We knew we were scheduled to travel up to Auckland by overnight train, but the devil once again resided in the detail. No sleeping accommodation, no heating, food or drink on board. I gather these days this line is a tourist attraction, but back then NZ trains were…….basic. We arrived next day in Auckland exhausted and dispirited, having consumed only meat pies and stewed tea at deserted stations en route. Nobody met us on arrival to welcome us and take us to the guaranteed accommodation, so we booked into a hotel in Queen Street, without the means to pay. Once we recovered I contacted the Education Department in Wellington and gave them an earful, but they passed the buck to the Auckland Education Department who denied all knowledge of our existence, let alone the agreement by which we were guaranteed a house for the next three months while I did my so-called teacher training course at Mount Roskill Grammar School. Even though this agreement was in writing, they never delivered on the promise, and they would not even foot the hotel bill. Once my new employers finally got round to admitting we existed, things improved marginally. We found a three room flat in a slightly shabby ex-colonial house in Mount Eden, complete with an ancient and fearsome gas-fired contraption called a Califont to heat the bathwater, an inside lavvy and a copper washtub out back which you had to heat by lighting a fire under it. Sadly, having successfully lit the fire we forgot to fill the tub, and so managed to melt its solder. Which was quite amusing. Still no trunks though, just the customs bill which I was not going to pay. On the other side of the thin hardboard bedroom wall we heard music and voices. Our next door neighbours were Arthur and Jacqui, an Anglo-French couple who were even worse off than us. They were on an extended honeymoon, but they were banned from continuing their round-the-world trip because Arthur had picked up some kind of tropical gut bug on their way out. In a way, they saved our lives. Boozy evenings either side of the party wall, until Arthur was eventually cleared for repatriation. Evidently alcohol did the trick. One day we came home to find our trunks mysteriously being dumped outside the front door from the back of a proverbial lorry. No paperwork, no apology – nothing. I suspected that the customs officer on the ship had fouled up but they could not officially admit it. Suddenly we were surrounded by piles of pristine towels, the wedding present of choice for newly wed immigrants. Quality stuff too. I think we may have even repatriated some of them six years later when we returned to the UK in 1973. The next little surprise came about one evening when we returned from a visit to a downtown cinema. As we entered our living room we saw we had a visitor from hell – a scary kind of insect straight out of a horror movie, with long waving feelers, a hard leathery segmented body and barbed back legs, about the size of a small mouse. And it was heading straight for us. I tried to beat it to death with a poker, but it just kept going. Nightmare on Mount Eden Road. I think in the end we abandoned the room as the poor creature just kept going, the walking wounded. Fifty years on I still feel bad about this. Sorry bug, they didn’t tell us about you. 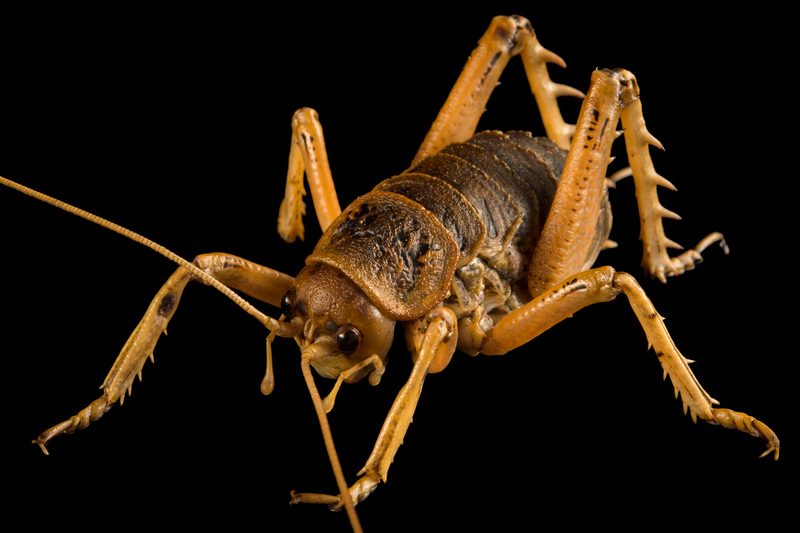 It turned out to be a weta, an insect only found in New Zealand, a kind of bush cricket, usually harmless though they can give you what for with their rear facing barbs if you really annoy them. What we didn’t know was that they come in all shapes and sizes and this one was a relatively small variety. We found the big ones later when we moved to Wellington, where they lived under our house, made clicky noises and got eaten by our cat Ginger who sucked out the juicy bits and left the skulls in the airing cupboard. They are the heaviest insects in the world, so heavy they can’t jump, which is a relief. They don’t feature much in New Zealand tourist board publicity. Hard to love, wetas, with the best will in the world. The teacher training course turned out to be another poor joke. Learning on the job, under the stern eye of a genial but old-fashioned Scottish schoolmaster who wore an academic gown. Actually it was pretty easy – lovely well-behaved kids and pleasant colleagues, as far as I remember, something of a contrast to my first schoolteaching experience in inner city London, run by racists, scheduled for closure. Mount Roskill turned out to be your archetypal NZ suburb – row upon row of Pete Seeger style little boxes, all looking much the same. I recall the afternoon ritual drone of a hundred motor-mowers, standard issue wooden bungalows (some clad with pretend-stone slabs made out of coloured volcanic grit, a speciality of Mount Roskill), and being given tinned spaghetti sandwiches for lunch by adoring twelve-year-old girls. Or sometimes cold baked beans. I even began to quite like such bizarre fillings. And it was nice to be adored. The job itself was absurd. I was engaged to teach French to New Zealand kids and to inspire in them a love of French culture. The nearest French-speaking territory was New Caledonia, 2,300km away in the Coral Sea. What exactly was the point? As an exercise in futility this was right up there with Sisyphus. They also did it by the book – literally – an american textbook at that. The only lesson I learned at Mount Roskill was just how old-fashioned New Zealand secondary education was. Teachers with gowns, the cane for the boys, lots of sport, prayers – the lot. This in marked contrast to their progressive primary and “middle-school” practice. In line with the guaranteed job clause, toward the end of the Mt Roskill gig, a list of vacancies turned up and I applied for several. The system favoured applications for rural jobs by means of a country service salary bar, limiting the earnings and ambitions of any teacher preferring to stay in the city. So I scoured the NZ Education Gazette (now Tukutuku Kōrero) for suitable rural vacancies, and applied to a few. The only taker was a school in a town called Dargaville, about a hundred miles north, on the west coast of Northland, a relatively sparsely populated part of the country with a sub-tropical climate. I was invited for an interview with the headmaster, an elderly man called George Ball. The only way to get there was by bus, so I bought a return ticket. As the bus rattled over the Auckland Harbour bridge and up the main road past the affluent North Shore suburbs, all seemed normal, but when we turned west, it all got a bit old-time. The townships got smaller and in between them the road surface would change from tarmac to road metal and the bus kicked up its own dust storm as it bowled along. It was for all the world just like one of those American films set in the twenties, but without the tumbleweed. The further west we went, the stronger this impression became, and when the driver started lobbing out rolled up newspapers on to verandas I really did wonder what I was getting into. 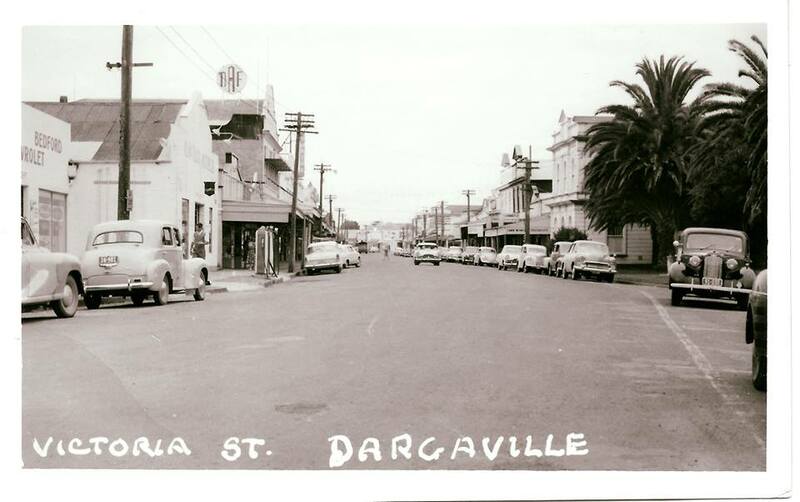 Eventually the bus crossed a wide muddy river over a rickety wooden bridge, and then arrived at Dargaville bus stop. The main street did not disappoint, two rows of clapboard shop fronts, a filling station and a cinema, with cars out front, parked along sidewalks with posts supporting corrugated tin roofs, reminiscent of hitching posts. No horses, few humans but plenty of cars. I waited for the tumbleweed, but it never came. Just a short-sighted stocky man with a crew cut. Who knew my name. This entry was posted in Everything else!, Memoirs and tagged assisted passage, Auckland, bureaucracy, Capetown, customs, Dargaville, Durban, emigrant, French, immigrant, Las Palmas, Maori, Melbourne, Mount Eden, Mount Roskill, New Caledonia, New Zealand, Northern Star, Perth, pohutakawa, school, South Western House, Southampton, Sydney, Toronto, towels, tumbleweed, Wellington, Wembley, weta by peterdewrance. Bookmark the permalink. Thanks Paul. Maybe I have made it sound worse than it was, but it’s all true. To be fair, it got better for us as time went on. On the way out we met loads of moaning poms banging on about how awful England was and how clever they were to have escaped. We never thought this way, and I reckon they mostly were back home within the year. It’s all a matter of expectations. Later on we met some lovely New Zealanders who took us to their hearts, and life was easy. Next episode in the pipeline……..
What dates did you leave England and arrive New Zealand? I travelled as a 5 year old with my family on the Northern Star in ’67. We arrived Auckland 08 September so would’ve left Southampton some time in July.